Welcome to M Wallace, our newest reader! Actually, I have placed myself in the doghouse temporarily because M Wallace joined us on 1/25/12, and I am just now realizing that. Sorry M! And if DHS76 means anything to you, I know who you are! :) Regardless, it doesn't matter, I'm just glad you're here. Welcome! I realize that I "talk" a lot about my babies - my 3 wonderful pets. So, warning - if you are tired of hearing about Nonni and Bentley - you may want to stop reading now. They get their own post today. These two are SO different. And to me, it is their differences that make them just SO darn cute! For example, Bentley can't stand to be cuddled and he is happiest when he has gone swimming, then immediately after getting out of the water, finds mud to roll in. The dirtier he is, the happier he is, much to his mommy's chagrin. Consequently, Bentley gets LOTS of baths. Here is a picture I posted on FB of him chillin' after his bath yesterday. 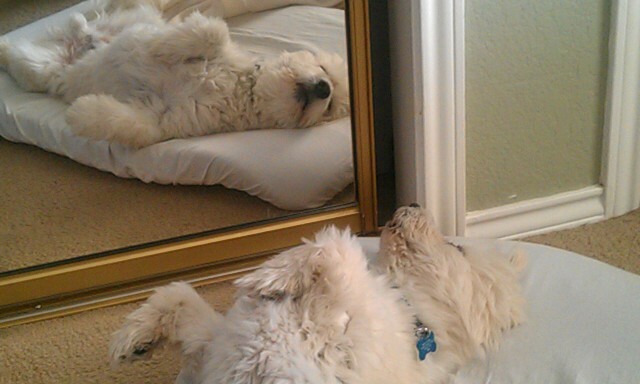 He fell asleep looking at himself in the mirror! Is that just too cute, or what? By the way, this is his favorite pose for sleeping. Nonni on the other hand, tiptoes through dew, can't stand to be dirty, curls up in a ball when she sleeps and loves nothing more than to snuggle while doing it. And while Bentley can't stand any kind of cover on him, Nonni absolutely cannot stand to be cold. They really are SO different! One more thing - I know all you techies are going to laugh at me, but this is my 1st attempt at taking a video with my phone. It's of my doggies and it's only 10 seconds long and it took me forever to figure out how to download it. I even posted it on FB. I was just SO darn proud of myself. ROFLOL. One has to start somewhere, right? It was a beautiful day for a hike and the puppies were so patient with me. But at the end of the video, look how different they are - they go in complete opposite directions. SO different, but oh SO cute and loving. Thanks for indulging me on this dog day afternoon! All right! See now that's something I don't know how to do yet. But then my phone *sigh* what am I going to do about it's quirkiness? @ Maria - You sweet thing! But I happen to know that your 1st attempt would have probably been edited, include music and headliner text! I may have done it first but when it comes to this stuff, you will always do it best. 1/20/12 - But Who's Counting? 1/19/12 - My Wonderful Readers! 1/14/12 - 69! In January! I Noticed.